Paul Young and myself at ESO (photo by Simon Lowery). 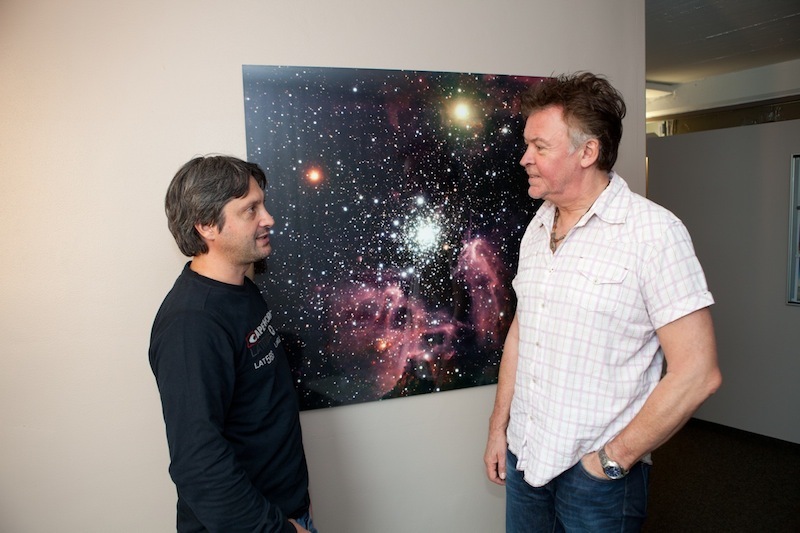 Last week I met the rock star Paul Young. Do not ask me how and why. It just happened. Well, a friend of Paul is actually working at ESO, and is name is Simon. So, for a number of coincidences, I was asked to give Paul Young an introduction to ESO, showing him a bit around, and explaining what we do here. He listened very carefully to what I said, and he asked lots of questions. Certainly an interesting person, let aside him being a rock/soul star. I still can’t believe this. It was many years ago that I was listening to “Come back and stay“, “Love of the common people“, “Wherever I lay my hat“, “Senza una donna/Without a woman” (with Zucchero “Sugar” Fornaciari). You know, one of those things that you would never expect to happen. All the more if you are an astronomer… But Simon has more aces in his sleeve. So, you can expect some more surprises in the future. By the way, you remember that some time ago, with Jayant Narlikar, Ken Freeman and Vijay Mohan we tried to find traces of stars older than the universe. Well, the saga is now over, and the Big Bang model is still safe. I’ll blog a bit more on that. Now let me get back to “Next”, a nice movie with Nicolas Cage. Then, good night.